100% cold-pressed coconut oil is made from selected coconut growing in the Tapi River Valley, in the province of Surat Thani in southern Thailand. Coconut oil - a powerful antioxidant for a long time it was considered a great beauty products for the maintenance of female youth, health and beauty. - Facial care and body - moisturizing, softening, nourishing and smoothing means, used either alone or as a basis for many cosmetic procedures, as well as an additive for the production of first-class cosmetic products (scrubs, masks, etc.). It combats cellulite and stretch marks. 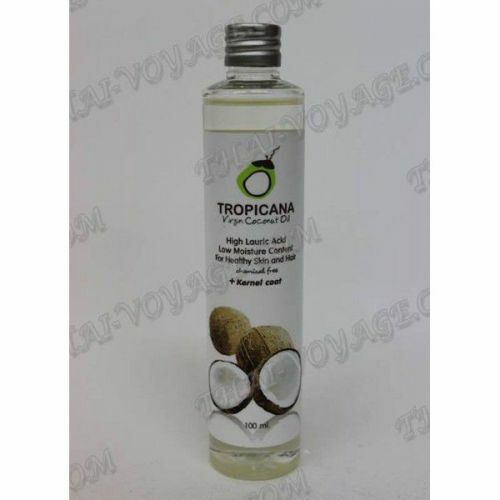 - Coconut oil has anti-inflammatory and antimicrobial properties. Known for its antimicrobial, antifungal (active against Candida fungi) and antiviral activity (against viruses of influenza, measles, herpes). - Massage with coconut oil relaxes the muscles, calms the nerves, relieves fatigue and makes the skin fresh and velvety. Due to its composition the oil is viscous consistency, but it is quickly absorbed into the skin. Below 24 degrees oil solidified. Return it to the liquid state will heat a water bath. His properties at the same time it does not lose.